In January, partner Cheryl Blackwell Bryson died at her home in Hyde Park in Chicago after a long battle with cancer. Cheryl's Duane Morris partners, colleagues, friends and members of her community recall the Employment, Labor, Benefits and Immigration partner as a leader in her field—the first African-American female in the Chicago legal market to be promoted to partner at a major law firm and an active member of her community. Among her many civic involvements, she was a board member of Chicago's Sinai Healthcare System; a member of the board of advisors for Loyola University's Institute of Industrial Relations; a board member of Chicago's YMCA System; and chair of the Trustees of Chicago's DuSable Museum, a prominent museum of African-American history. Cheryl was consistently named among the top labor and employment lawyers in Illinois and nationally. 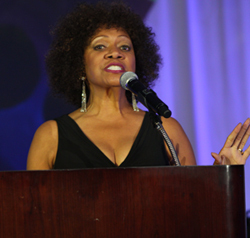 Her most recent award was the Launa T. Thompson Award presented to her last year by the Black Women's Expo. Cheryl also won, among many other such awards, the National Bar Association's Hermann Sweatt Award for outstanding lifetime achievement. Cheryl Blackwell Bryson speaks at a podium to welcome guests to Sinai Community Institute's 2011 fundraising dinner. "Cheryl was an extremely talented and creative labor and employment lawyer who was relied on over the years for great advice and counsel by many clients. Cheryl joined Duane Morris in 1999 as one of the original partners in our Chicago office. She was a delightful person to be around, with a real flair. She was someone who, in a very inspirational way, overcame many obstacles—including persistent health problems—to become a very successful and well-respected lawyer. Cheryl was a leader in many significant civic and community causes, and she was repeatedly honored and given awards throughout her career as a major "pioneer," both as a female lawyer and as a lawyer of color." "I wouldn't be where I am now, were it not for Cheryl, who lobbied for me to lead the Chicago office. I learned a lot from Cheryl about marketing. She was one of the most adept marketers I've ever known. It came naturally to her. Everyone liked Cheryl. She was a mentor to a lot of people. Also, she spoke her mind. Cheryl didn't hold back. She'd tell it to you straight. The clients I had loved her. We miss her." 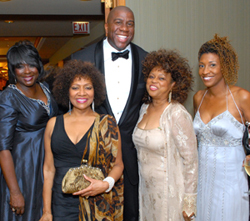 Debra Wesley, Cheryl Blackwell Bryson, Redessa Harris and Felicia Barnes Bryson pose with Earvin "Magic" Johnson during Sinai Community Institute's 2011 fundraising dinner. Cheryl was a board member and served as event chair. "Cheryl was my best friend, and we'd been friends since we met in the seventh grade. She was always very determined, very driven. I can remember even back then she would set clear goals for herself and studied hard. She believed that failure was not an option. She was also very spiritual. Faith was important to her because it really held her up during all the tragedies in her life. Cheryl never gave up, absolutely never. Even when she was sick, she would take care of herself as best she could. What else can I say about my girlfriend? We used to talk every day. I saved her last voice message on my phone, and I listen to it each day and resave it. I don't ever want to forget what her voice sounds like." "The very first day we met, I knew she was a force to be reckoned with! Bright and direct, yet compassionate, earthy and incredibly spiritual. Over the 10 years I had her in my life, she impacted me in ways that changed me forever. She was my mentor, my friend and my confidant. Even when she was grieving for those she had lost over the years, she was always there if you needed her, selfless and caring. She reassured me when I was afraid, and she reminded me of my accomplishments when I couldn't see. Perhaps the lyrics to this song say it best: 'Thank you, thank you, thank God for you . . . you are the wind beneath my wings.'" 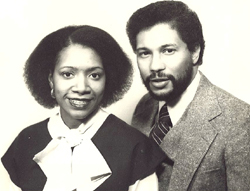 Cheryl with her husband Dr. James Bryson, who died of cancer in 2000. She is survived by her son, Blake. "I remember one Friday afternoon in 1993 I was sitting in my office and Cheryl walks in and asks me if I had taken any employment law classes in law school. I said that I hadn't. She said, 'Good. Read this,' and pulled out a thick volume of BNA on diversity training. 'You're going to be teaching it next Tuesday,' she said. The following Tuesday, we began teaching diversity training sessions in 14 different locations. She had contagious energy and great emotional intelligence. If you could keep up with her, she was a wonderful mentor, really invested in people and relationships. It was because of her that I became a labor and employment lawyer. She took me under her wing and she trained me. She was a tremendous friend." "Cheryl made quite an impact on me. She and I spoke at length at a Diversity meeting and pitched a client together with a lateral diverse partner. I know that she loved to dance. I have dedicated a perpetual trophy for my daughter's dance school in her memory."